In Debate - World footy rankings 2008 - Peace Team, Great Britain and Catalonia we began the debate towards a set of World Rankings for 2008. In today's article we ponder the status of Ireland's AFL players. So what about the Irish players? Ireland finished fourth at the 2008 Australian Football International Cup, but they did not have access to their professional players on AFL lists. At this stage of the game's evolution it was not realistic to expect that they would be made available, and whether they should have is not the purpose of this debate. The question is whether they should be included when pondering a world ranking system. Should the rankings only reflect matches played, or should it consider the strongest nations in terms of the teams they theoretically could put on the field, given their professional players too? In 2008 there were four Irishmen playing regularly in the AFL - Tadhg Kennelly, Martin Clarke, Colm Begley and Setanta O'hAilpin, as well as the fully listed Aisake O'hAilpin a regular for Carlton's VFL feeder team, the Northern Bullants. On top of that were players like Pearce Hanley and Brendan Murphy on AFL rookie lists playing a tier lower. Given that Ireland have finished 1st, 4th and 4th in the three International Cups so far, a strong argument could be made that if the above seven players were added to the Warriors, they would quite possibly have won the tournament on every occasion. But none of those players came through the Irish league - they were all head-hunted Gaelic football or hurling players in Ireland. Does that matter? Even more difficult - should our attempt at World Rankings assume only amateur players and only the form shown, not the theoretical possibilities if all players were available? One could go even further and imagine that if the best Gaelic footballers had swapped codes for an Australian Football World Cup, they would easily have made the final against Australia. That is going too far, as then one would have to consider athletes from all sports making the change. So do we aim for the best Aussie Rules nations assuming all players available, or restrict it to purely amateur status? And if so, what about the Papua New Guinea players who are on scholarships to Queensland. Surely they have a role in the IC if available but would they fit an amateur criteria? Where do we draw the line for world rankings? You can draw the line wherever you want, but it would be nice to be consistent. It depends whether you want to rank the countries on the teams they can put out or just theoretically put out. Both are good talking points. I would like to add to the 'theoretical' Irish case, all the other Irishmen playing Aussie Rules at clubs around the world outside of Ireland (including at IC08 where they played for other countries) who might also increase the strength of a selected Irish team. Trent Croad, Adam Campbell, Ben Cunningham, etc, etc. (I believe there are another 10 playing in state leagues) New Zealand could muster a great team if they could also include players not coming through the NZAFL. This then also raises the question. 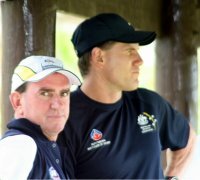 When do we get a Australian Amateur side involved, possibly to take on the World Side selected at the International Cup? It needs to evolve and include an Australian team somewhere along the line. The line has to be drawn at professional level, no AFL players allowed. In Ireland, AFL Ireland need to develop the league more and bring players through this avenue, and not cherry pick. Otherwise the game will never develop, especially with Hurling and Gaelic Football been the dominant sports played. Where'd you get the info that Ben Cunningham is from New Zealand ? Was he born there or had parents from there ? I think the ranking should reflect the kind of teams, which the countries that compete at IC level can deliver. Aka any contacted player in AFL, VFL or probably any other state league would probably never want or be given permission to play in the IC at its current level. So they are ruled out. Even players that might be on contract in good leagues like Melbournes Eastern FL or money filled country leagues might not be considered, as they´d hardly be interested in playing for even an Aussie national team in a tournament like this. Simply, if a player will not be available due to contract conflicts or lack of interest in the IC, they shouldnt be counted in. I kind of agree with what Niels is saying. However Queensland's state league is quite reasonable, and a lot of the PNG were playing that this year, but still represented PNG - and with great pride. I don't think the criteria should exclude them. Increasingly it will be a real issue though for the IC, especially if it continues to be staged near finals - clubs will not want their semi pro players leaving during finals. Regarding NZ born players like Trent Croad, under current IC rules, I think some may qualify for NZ, some would not - they would've spent the key junior years in Australia playing footy. HOw about we have a look at a theoretical 'World Cup' eligibility criteria - best line up for each nation. let's get Aaron Edwards in the Samoan squad, and a Kiwi squad with Croad etc. The theoretical Irish side, and just what quality 'WC' rules Italian, Greek etc squads that could be assembled (inclusive of state league players if required). Alas, it'd be too late to put my hand up for Denmark (parentage), but I could put my hand up as boot studder. I agree 100% with Mick. Best possible sides. Even if they can't play in the IC (which is rightly a development competition), this is the, if any, to start hypothesizing. Let's bring the criteria in line with those of the world cup of just about every other sport in the world and relate to the All-Australian team to put things into perspective as well. If you want to put this in comparison to any other world sport (which has a world cup), arent the countries based on their performances on the field? And so, if some of a certain country´s players do not play due to personal issues or club issues, their national team does not get a boast on world rankings. They are still compared on what they have brought on the field in the past. In icehockey Denmark has recently had a lot of draftees to the NHL, so they miss out on a lot of the Denmark games at the world cup. And if the Danish team loses because of this (missing the players due to club commitments), we'll still slide down the world ranking scale. This is in line with most other sports, and so if any player (be he Aussie or not) cant/wont compete because of club commitments or personal issues. They arent counted in. I think we do need to try to stick to what Niels is saying. If we wander off to rankings based on too many theoretical conditions then there's no reality to it. How do we judge any of the teams if many of them are mostly made up of players that would be available in theory only? There must be a reasonable belief that they would play. 2. Semi pro or pro but only if they have shown an availability to play, e.g. the PNG players on scholarships/working in Queensland who played for PNG in the IC08. This doesn't exclude ranking Australia as #1, as there is no doubt that there are 1000s of quality footballers in Australia who would jump at the chance to represent their country.